Kirkpatrick Mallable Iron Plain Black Letterplate. 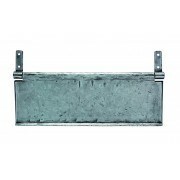 266 x 108mm outside measure 203 x 44mm opening 241mm fixing bolt centres ..
Kirkpatrick Mallable Iron Plain Black Letterplate. 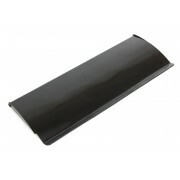 340 x 102mm outside measure 238 x 50mm opening 296mm fixing bolt centres ..
Kirkpatrick Mallable Iron Plain Black Letterplate. 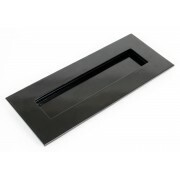 352 x 127mm outside measure 268 x 62mm opening 313mm fixing bolt centres ..
Kirkpatrick Mallable Iron Black Letterplate with Knocker. 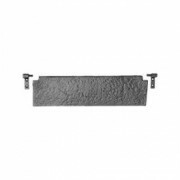 O.A 295x108mm Opening 203x44mm Bolt Centres 254mm ..
Kirkpatrick Tradition Ironwork Internal Black Letter Flap, fit inside the door to cover external letterplate aperature. Available in 3 sizes 241x76mm, 292x76mm and 355x101mm ..
Carlisle Brass Classical Collection Curved Pattern Letter RTidy designed to cover the two holes left when fitting the bolt through fixings for a letter flap. 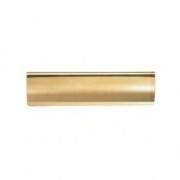 They also help to reduce drafts, and generally tidy the inside of a door Polished Brass .Sizes 280mm x 76mm or 355mm x 127mm &n..
Carlisle Brass Classical Collection Tidy covers unsightly holes left by the bolt through fittings on letter flaps.They also reduce drafts .Finished in Polished Chrome or SSCP Please ensure the size (355 x 127) will cover the letter plate it is designed for. ..
Carlisle Brass Classical Collection Tidy covers unsightly holes left by the bolt through fittings on letter flaps.They also reduce drafts. Finished in Polished Chrome or SSCP. 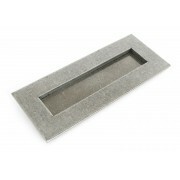 Please ensure the size (280 x 76) will cover the letter plate it is designed for. 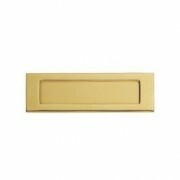 ..
Carlisle Brass Classical Collection Large Plain Letterplate. 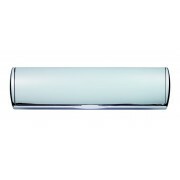 Available in Polished or Satin Chrome. Outer Frame 305 x 103mm, aperture 248 x 60mm. Fixing centres 275mm. 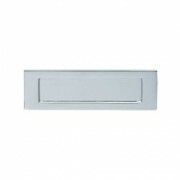 ..
Carlisle Brass Classical Collection Plain Letterplate Polished Chrome 282x80mm outer frame 230x50mm aperature 260mm fixing centres ..
Carlisle Brass Classical Collection Plain Letterplate. Available in Polished or Satin Chrome. Outer Frame 257 x 80mm, aperture 185 x 40mm. Fixing centres 220mm. 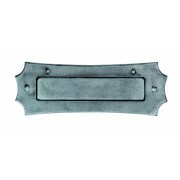 ..
Internal Letter Pewter Letterplate Cover. 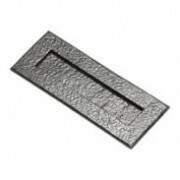 Fitting this on the inside of your front door over the hole for the letterplate will help reduce draughts and tidy up the appearence. 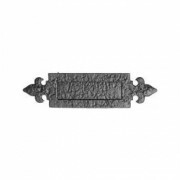 Size: 355x127mm o/a ..
Kirkpatrick Ornate Mallable Iron Black Fleur de Lys Letterplate. 304 x 76mm outside measure 144 x 38mm opening 222mm fixing bolt centres ..
Kirkpatrick Ornate Mallable Iron Black Fleur de Lys Letterplate. 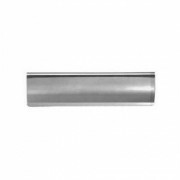 O/A 362x88mm Opening 203x44mmm Bolt Centres 277mm .. Sprung Loaded Large Pewter Letterplate Size: 324x108mm o.a. 260x44mm opening size, 292mm fixing centres ..
Carlisle Brass Classical Collection Large Plain Letterplate Polished Brass Outer frame 305 x 103mm, aperture 248 x 60mm, fixing centres 275mm. ..
Carlisle Brass Classical Collection A4 Plain Letterplate Polished Brass Outer frame 282 x 80mm, aperture 230 x 50mm, fixing centres 260mm. 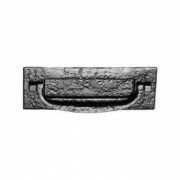 ..
Carlisle Brass Classical Collection Plain Letterplate Polished Brass 257x80mm outer frame 185x40mm aperature 220mm fixing centres ..
Carlisle Brass Ludlow Foundries Pewter Letter Tidy 300mm x 100mm ..
Carlisle Brass Ludlow Foundries Pewter Letterplate 280mm x 100mm ..
Carlisle Brass Pro Style Letterbox to suit door 40-80mm thick Overall 310x76mm, Aperture 264x46mm. Polished Chrome. ..